The delta approach: a comparison of the “delta’s” (post measurement minus baseline measurement) using a independent samples t-test. The ANCOVA: A regression model with the pre measurement and group as predictors, and the post measurement as outcome variabele. 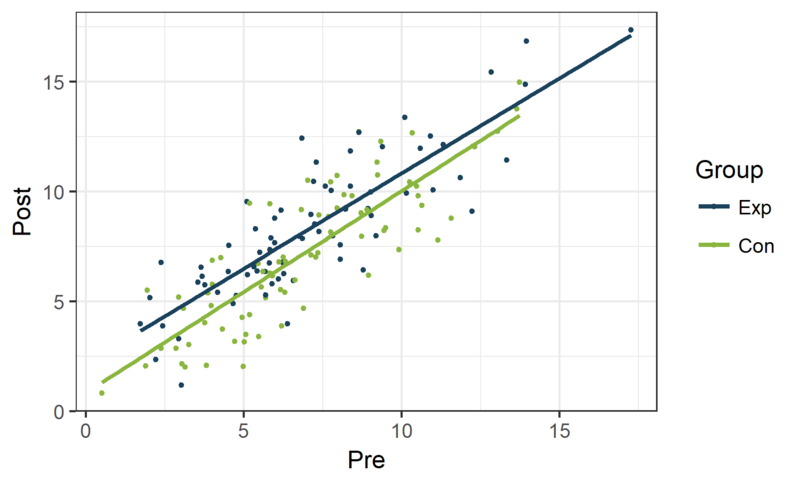 In this tutorial, we will apply the constrained longitudinal data analysis (cLDA) model in R.
LDA (as defined in Liu, 2009) is a mixed model approach where both baseline measurements and post measurements are modeled as dependent variables. The model includes at least Group, Time and their interaction Group:Time as predictors. We’re specifically interested in the interaction term, telling us whether the changes in mean response over time differ accross groups. In contrast to the ANCOVA and delta approach, all subjects with at least one measurement (baseline or post-randomization) are included in the analysis. The models can easily be extended to 3 or more repeated measures. 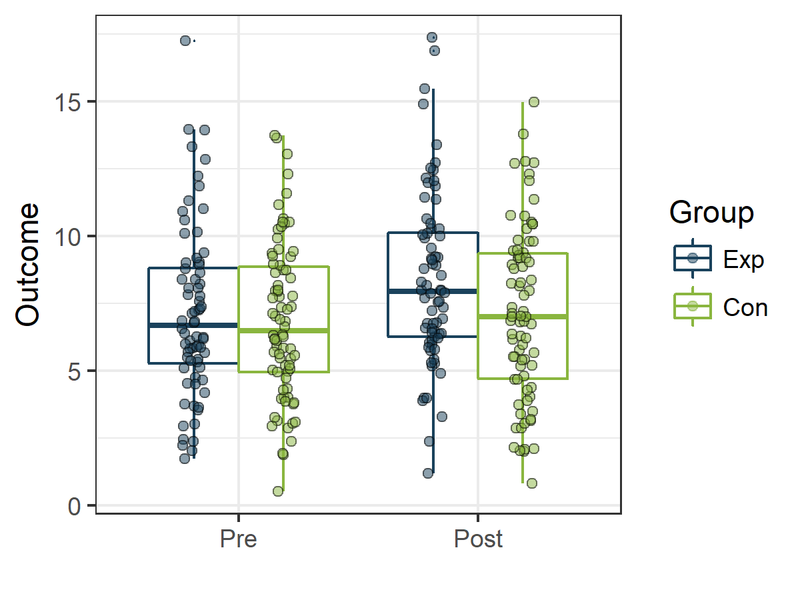 It is possible to model the correlation between baseline and post measures differently for different treatment groups. 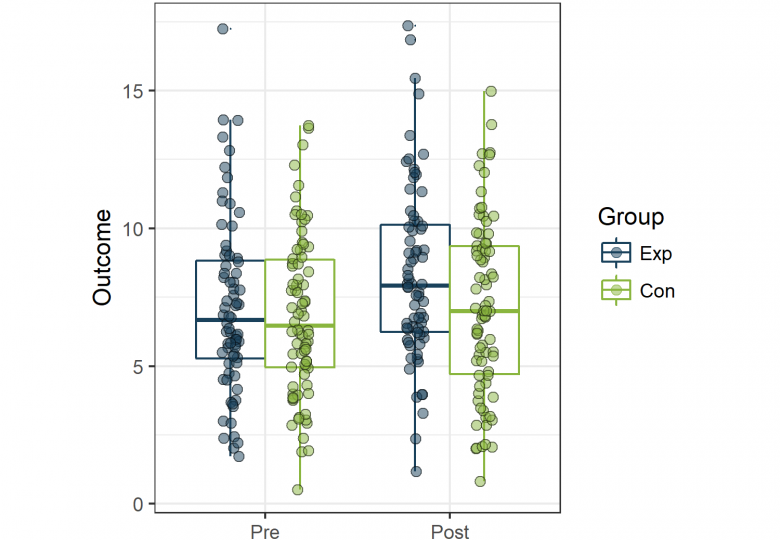 I’ll share with you how to perform this analysis in R. At the end of the post you’ll find a short section about non-randomized experiments/studies. Data were created using the simstudy package. Each subject has equal chance to be assigned to either the Control group or the Experimental group. Both Pre and Post measurements are normally distributed. The assignment has no influence on the pre measurement. 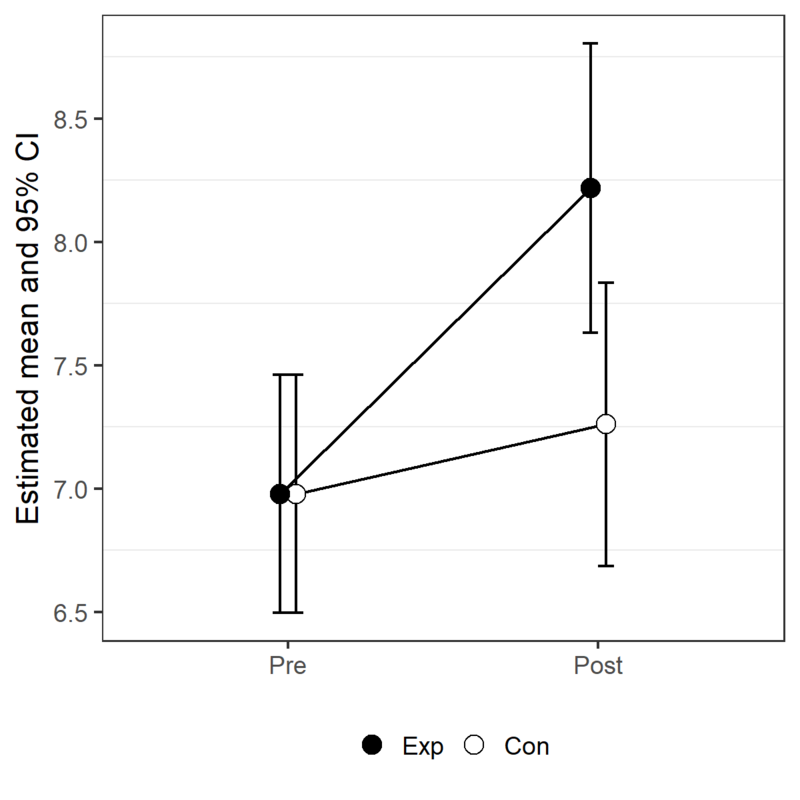 The post measurement depends on Group (Exp or Con) and on the baseline measurement (Pre). When applying mixed models, the baseline measurement is seen as part of the outcome vector. All measurements (pre and post) should appear in one column (the variable Outcome ). Tidyverse’s gather() function is one of the many ways to do the job. In this example the columns Pre and Post are “gathered” in a column called Outcome (=value). The new variable called Time (=key) will show us whether it concerns a pre or post measurement. The gls() function of the nlme package can be used to apply LDA modelling. Fixed part: The terms of the most basic cLDA model are Time and Time * Group . By omitting Group , there is no term allowing for a difference in means at baseline between the groups. Consequently, the baseline means are assumed to be equal. However, a general rule in regression modelling is that when adding an interaction to the model, the lower ranked effects should also be included in the model. For this reason, R will automatically include Time and Group as main effects in the model when including the interaction term _Time*Group_. To avoid to have Group as a main effect in our model, we will create an alternative model matrix: Xalt. Random part: The standard deviations and correlations that should be estimated are defined by the constant variance function varIdent(). By setting weights = varIdent(form = ~ 1 | Time) a separate standard deviation will be estimated for each time point and a seperate correlation will be estimated for each pair of time points (= unstructured variance covariance matrix). Applied to our example, we expect an estimated standard deviation for Time=Pre, an estimated standard deviation for Time=Post and one estimated correlation between the pre- and post measurements of the same subject. Remark: By setting weights = varIdent(form = ~ 1 | Time:Group), a separate variance is estimated for each combination of Group and Time (Pre-Exp Post-Exp Pre-Con Post-Con ). The argument correlation=corSymm (form = ~ 1 | Id) defines the subject levels. The correlation structure is assumed to apply only to observations within the same subject (in our example: Id); observations from different subjects (a different value for Id) are assumed to be uncorrelated. The p-value for the interaction effect (the effect of interest here) is 0.0007: the change in mean over time differs significantly between groups. The estimated difference in change is -0.95 (SE: 0.28) (Con increases 0.95 less then Exp). The estimated correlation between Pre and Post is 0.842. The estimated standard deviation for the Pre measurement is 3.01 and the estimated standard devaition for the Post measurement is 1.059 * 3.01. We can obtain predicted means using the gls() function. 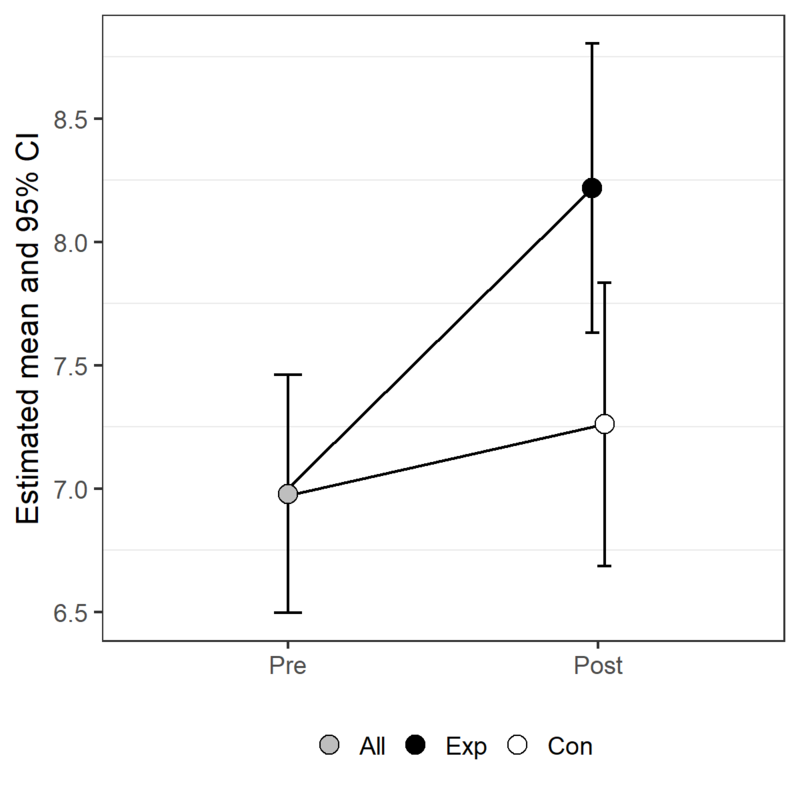 As expected, the predicted value is the same for both groups at baseline ( Time == Pre). Preferably we also report the confidence intervals. That’s where the Gls() function of the rms package comes in. It uses exactly the same arguments as the gls() function, leading to exactly the same predictions. But the Gls() function allows us to create confidence intervals. To my opinion, this plot can be misleading. One estimated mean is presented by 2 different dots. I prefer to create the factor Group2 and remake the plot. In the case of non-randomized experiments or studies an equal mean at baseline cannot be assumed. Consequently, applying constrained LDA is not appropriate. It is however possible to perform an LDA (without the constraint). By including Group in the model (next to Time and the interaction term Group:Time ), the baseline means are allowed to differ between groups. There’s no need to create the alternative model matrix Xalt in that situation. (Xalt can thus be replaced by Group:Time ) The remaining arguments (random part of the model) doesn’t differ from the model we presented for cLDA. – Fitzmaurice, Garrett M., et al. Applied Longitudinal Analysis. John Wiley & Sons, 2004. – Liu GF, Lu K, Mogg R, et al. Should baseline be a covariate or dependent variable in analyses of change from baseline in clinical trials? Stat Med 2009; 28: 2509-2530. – Pinheiro J, Bates D (2000): Mixed effects models in S and S-Plus. New York: Springer-Verlag.